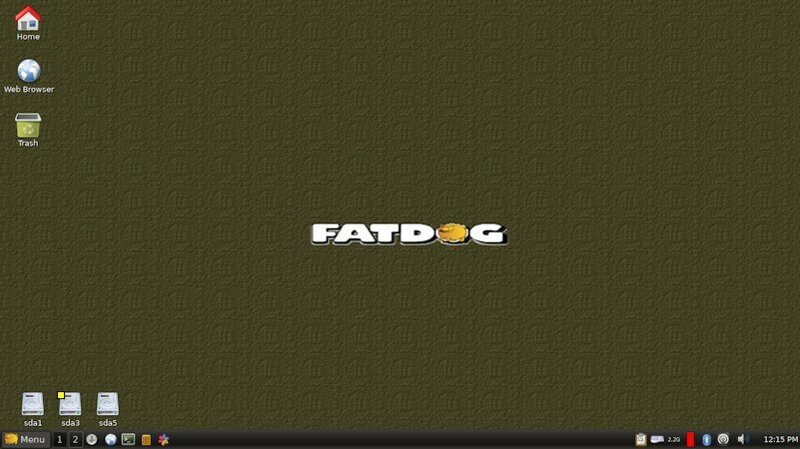 Fatdog64 631 is the final version of Fatdog64 600 series. There will be no further work done on the 600 series. Development has moved full-steam to the next generation Fatdog64, the 700 series. The existing ISO downloads, packages, and contribution packages will be kept online for the foreseeable future. For contributors: Many of the existing Fatdog64 SFS-es designed for Fatdog64 600 series will continue to work in the 700 series (e.g, the recent Stellarium SFS from WillM will work on 700 unchanged), so don't worry, your work is not wasted. In fact, I'm quite certain that 631 will still continue to be used for a while even after 700 is released, so please continue to contribute. Thank you. Kirk and James are pleased to announce the release of Fatdog 630 Final. This release marks the fourth, and probably last, release of the Fatdog 600 series and comes with a lot of improvements over the last release, Fatdog64-621. For those who are new to Fatdog, please read the Frequently asked Questions and Answers (FAQs) to save yourself from headache (the same documents are also included in the ISO on the browser home page). UPDATE: Nvidia drivers uploaded to package repo. There are two of them: standard branch 331.38 and legacy branch 304.119. Please look up here and here to check which driver supports your card. Note: The legacy one is tested and works; the standard one *is not tested* because we lack the hardware capable of running it. * Edit acpi action scripts add switch debounce and shutdown confirm dialog. Plus some bug fixes. Same kernel as 630 so the proprietary video drivers are the same. Really a minor update. * Fix loading of some CPU kernel modules. * Linux 3.12.9 with user namespaces and parallel squashfs decompression. * Enable suspend with mounted usb drive. * Important multisession and usb-flash fix for certain scenarios where deleted files re-appear or saved files appears missing. * dvdrw patched with debian patched to support large capacity bluray burning - thanks rcrsn51! * Network-Wizard is replaced with Network Setup. * Fatsort command line utility for correcting the directory entry order on vfat for cheap mp3 players. Usage fatsort -n /dev/mmcblk0p1 makes directory entry order (ls -f) match alphabetical order. * Multiple sandboxes can run at the same time. * add ttyrec 1.0.8 (tty recorder), an enhanced version of "script"
* System hardware clock (hwclock) can be configured inn localtime or utc. * Wpa_gui now has a check box for "select any network". If you uncheck this box and want it remembered for next boot, you will need to go to File-Save Configuration. * Shotcut replaces Avidemux, a much better video editor. Note that there are no effects yet. * Enable bluetooth daemon by default. The most noticeable changes will probably be the addition of Firefox (Seamonkey is still there too.) and Razor-panel. Razor-panel supports dragging items out of the menu onto the desktop or to the quick launch area of the task bar and is more stable. Fatdog64 got a bit fatter this time too. Now it's about 250MB. The addition of VDPAU for Radeon and Firefox (11MB) accounts for most of the weight gain, the rest is the usual cost of upgrades. * DO NOT USE GRAPHIC DRIVER PET PACKAGES FROM OLDER VERSIONS OF FATDOG64. * DO NOT REUSE AN OLD SAVE-FILE OR SAVE-DIRECTORY. * DO NOT COMPLAIN IF THIS SOFTWARE CAUSES YOUR DOG TO DIE, THERE IS NO WARRANTY. EDIT: Update FAQ link. Thanks spandey. AMD/ATI Catalyst video drivers. The stable Catalyst drivers do not support Fatdog64-630's Xorg-server-1.15. These packages DO NOT include xorg-server-1.12.4, which is required to be installed first. Thanks to WillM who pointed out that Fatdog *is not affected* because we use an older version of OpenSSL, here. There was a bug enabling multi-monitor setup using the radeon driver for certain Radeon chips. It was a kernel bug and open for quite sometime; and is only recently fixed. Here is the bug report: https://bugzilla.kernel.org/show_bug.cgi?id=58121. The bug manifest itself by the inability to display laptop panel and VGA output at the same time; and here is the updated module (it is a pet that you need to install): http://www.smokey01.com/jamesbond/fatdog64/radeon-module-3.12.9.pet. It contains the latest KEYDB.cfg I can find and the latest vuk collection I can put together. If you get an error then the BluRay is too new. The key file only supports up to MKB version 30.
lol have to turn around and go back to download this good thing I checked while grabbing lunch on the go.. I installed to a 32gb usb 3.0 flash drive. That's it so far, will test more. Installed on the previously mentioned HP Elitebook 6830p w/o problems. Now posting from this. If wanted I can supply a hardware report with more information than you are likely to need. Added: Now posting from 630 final installed on my desktop with ASUS M2NVP-VM motherboard, dual-core AMD Athlon II 5200+ and 8GB RAM. Very smooth installation. Very crisp response. I'm only waiting now for a few days experience to confirm stability before I commit my main email archives to this installation. Manual frugal install on an old test box.Other than missing text for the icons on the desktop all else looking solid so far. The FAQ link on top doesn't work as in ends with htm rather than html. sound option missing. ati driver crashes x when starting any video. cant set multisession with usb guid id..
base2ram expand works as does newer no touch boot flashdrive idea copying EFI folder to base of a fat32 formated flashdrive. will there be Nvidia drivers? sound option missing. ati driver crashes x when starting any video. The built-in driver or the proprietary one? cant set multisession with usb guid id..
How to change Firefox from nightly to default one? hd5000 pet only default ok vlc crashes with video set to accelerated video checked with ati proprietary driver. It is in fact identical to Firefox 27, for practical purposes. But it shows as nightly because we don't build it following Mozilla's build practice, so it shows as nightly. Not sure if any noob will find this. If you compile your own Firefox you're supposed to get permission to use the official branding. Since we compile it and don't use official Mozilla binaries it's called Nightly. Yes, check that your Radeon card is a HD5000 or newer. It is a beta driver from AMD, but it's the only one that supports the Xserver that's included. Can't duplicate that, make sure you're using a new save-file.